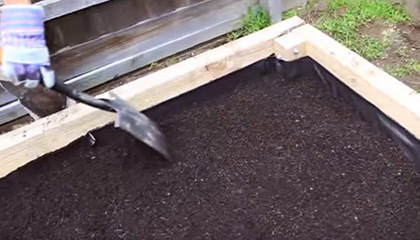 A proper raised vegetable garden box will provide fresh, home-grown vegetables all year round. 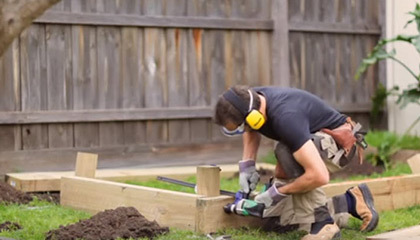 With Home Timber and Hardware’s range of timber and gardening materials a vegetable garden boxis bloomin’ easy to build your own. To help you do a proper job, we suggest you print this page and refer to it throughout the process. 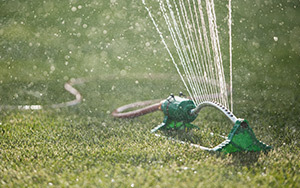 Find a flat patch of dirt that gets plenty of sunshine. If the ground isn't flat, dig to level. The ideal size bed is 1200mm wide, 2400mm long and 400mm(or two sleepers) high (pic. 1a); using 200mm x 50mm x 2400mm treated pine sleepers, which are ideal as they are resistant to rotting. Check your local Home Timber and Hardware for availability and alternative options. 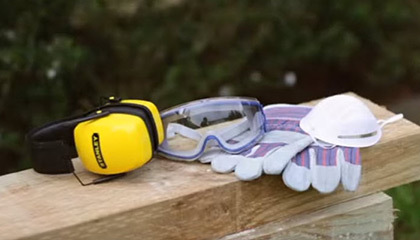 Be sure to wear safety goggles, dust mask, gloves and hearing protection (pic. 2a). 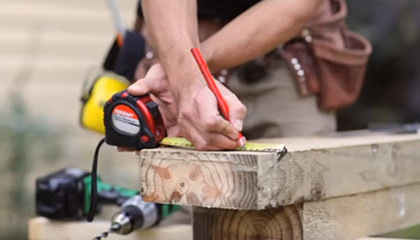 Measure 400mm and cut 4 corner posts using the 90 x 90mm treated pine posts. 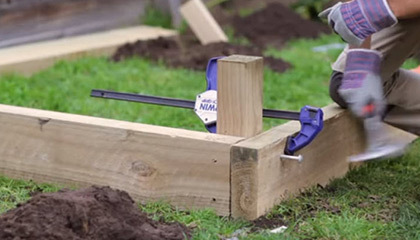 Measure 1200mm and cut the sleepers for the short ends of the bed to size (pic. 2b). Every sleeper needs two bolts to secure it to each corner post. 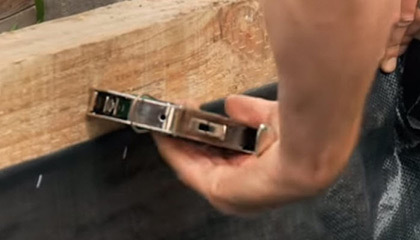 Mark and drill your screw holes (pic. 2c). Attach them to the corner posts using 175 millimetre galvanised coach bolts and washers. Hammer the bolts through the hole, add a washer, then fasten with the nut (pic. 2d). Using the same technique attach the long sleepers to the two end sections. Use a heavy duty stapler, or a hammer and carpet tacks, to attach the weed mat to the top sleeper on one of the long sides (pic. 3a). Unroll the mat to the other side, making sure it’s pressed up tight against the bottom corners, and staple into the opposing sleeper side (pic. 3b). 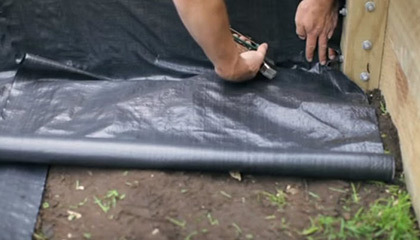 Overlap the rolls of weed matting by 100mm. Do the same from the short sides to ensure total weed cover. Add a well-draining garden soil, and mix with organic animal manure and homemade compost (pic. 4a). Fill the garden bed to around 30mm from the top. Now you can enjoy growing fabulous fresh vegetables (pic. 4b). 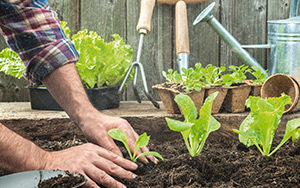 Get into your local Home Timber and Hardware to pick up seeds or seedlings. Follow the directions of the seed packets or plant containers to see how deep to sow the seeds and how far apart they should be planted. If you’re unsure, ask our friendly staff for proper advice on what to plant, and the type of fertiliser appropriate to your crop. 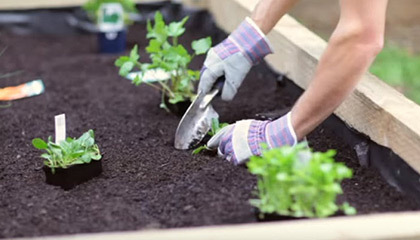 A raised garden bed conserves moisture, suppresses weed growth and extends the planting season. The custom soil mix allows for great soil quality, and because it isn’t compacted from walking, the roots have an easier time growing. 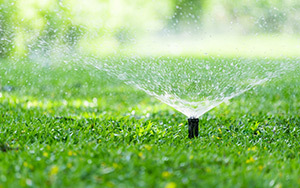 Plants can be grown close together so yields go up and water-use efficiency is maximised. What’s more, the soil level is higher, so there’s less stress on your back when planting, weeding and harvesting.